Is Europe Finally Ready for Genetically Modified Foods? Europe's New Economic Strategy: A Miracle Cure? It's hard to work up an appetite when other diners brand what you're about to eat "Frankenstein food." For many Europeans, that evocative label has told them all they need to know about genetically modified organisms (GMOs). Opponents of GM foods have managed to paint them as the freakish products of a dangerous technology created by hubristic scientists. But the European Union may have reached a tipping point in its awkward relationship with GMOs. This week, it quietly gave the green light to farmers to grow fields of genetically modified potatoes. It marks the first time that Brussels has approved any GMO cultivation since a moratorium 12 years ago. The GM potato, created by German chemical giant BASF, is not intended for human consumption. It has been developed to produce higher levels of starch, which is used in industries like paper manufacturing. Using the GM potato will save energy, water and chemicals. E.U. Health and Consumer Policy Commissioner John Dalli says the decision was based on "sound science" and represents a policy of "responsible innovation." Some E.U. member states and anti-GM campaigners remain unconvinced. Austria said it would outlaw growing the potato, and Italian Agriculture Minister Luca Zaia said he planned to "defend and safeguard traditional agriculture and citizens' health." 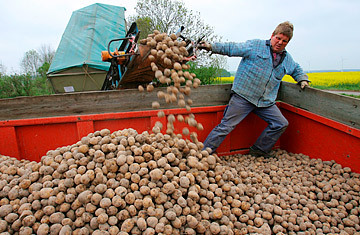 The environmental group Greenpeace said the GM potato contains a gene that confers resistance to certain antibiotics. "It could raise bacterial resistance to life-saving medicines, including drugs used for the treatment of tuberculosis," says Greenpeace E.U. agriculture policy director Marco Contiero. "This is an unacceptable risk to human and animal health as well as to the environment." But supporters of GMOs say these complaints have run thin. They point to the U.S., where more than 90% of all soya is now GM and no adverse effects have been found. "Opponents keep saying that GMOs might do this or could do that," says German Member of the European Parliament Britta Reimers, who is with the centrist, pro-business Free Democratic Party. "But after countless studies over the years, we have not seen a single verifiable piece of evidence that there are any health or environmental dangers in GMOs." Six E.U. member states  Austria, Hungary, France, Greece, Germany and Luxembourg  ban the cultivation of GM maize on their territories. The bans were declared illegal in a World Trade Organization panel ruling in 2006, following a case brought by the U.S., Canada and Argentina. The WTO said the national safeguards were not based, as required, on scientific assessment of the risks. In the face of fierce member-state opposition, though, the E.U. has yet to fully implement the WTO's ruling. Still, Europe's demand for soya means it has no choice but to import GMOs, since about 75% to 80% of the global soya crop is from transgenic breeds. The E.U. rules mean imported GM food has to be labeled and separated along the supply chain to safeguard against "contamination" of organic farms. Any produce containing more than 0.9% GM content must be labeled as such, a policy that can lead to shipments being sent back to the U.S.
Irritated by such legal entanglements, European Commission President José Manuel Barroso has signaled that he wants the European debate on GMOs to focus firmly on science rather than emotion, and he seems ready to use whatever procedural weapons are at his disposal to break the political deadlock in the approval process. Businesses have also weighed in, saying the E.U. 's reluctance to accept GMOs is costly: denying farmers money-saving technologies means European agriculture loses ground against rivals. And it runs counter to the E.U. 's ambition to foster innovation and technology; despite public hostility, Europe is home to some of the biggest biotech groups in the world. GSK Biologicals, for instance, which has headquarters just 15 miles outside Brussels, supplies about a quarter of all vaccines used throughout the world. "Europe's opposition to GMOs is a backlash against science," says Willy De Greef, secretary general for Europabio, the European biotech lobby. "We have a lot of catching up to do. While the U.S., Brazil, India and China have forged ahead in genetic engineering, we have lost a generation of good scientists." Food remains a sensitive issue for Europeans. A 2008 survey by E.U. pollster Eurobarometer found that 52% of Europeans felt that biotechnology would improve their quality of life, but 58% were apprehensive about using the same techniques to develop GM foods. Could public opinion now be changing? Recent debate over food security may be having an effect. The U.N. says the world population is set to reach 9 billion by 2050, requiring a 70% rise in global food production to feed the planet. With the added threat of climate change, GMOs like drought-resistant crops could offer hope that global demand will be met. "European public opinion on GMOs was shaken two years ago with the food crisis, when prices spiked wildly and there were riots around the world," says Jo Swinnen, senior fellow at the Center for European Policy Studies, a Brussels-based think tank. "People thought there would always be food surpluses and low prices. But that can't be assumed anymore." This might just be the moment Europe begins warming to GMOs. If so, it could finally lay to rest the Frankenstein-food moniker. Even Greenpeace has stopped using the term.